It was as a youngster in the mid-70s that I first considered the feasibility of the “holy grail” of the martial arts: a synthetic form that would combine all the best elements of the disparate styles into one cohesive, all-encompassing and succinct system: in other words the ultimate martial art. How much experience would/should one have to attempt the creation of a “synthetic” art that combined the best points of each? Bruce Lee appeared to have attempted such a feat at a fairly young age: However even as a child I had my suspicions that his Jeet Kune Do was less a synthesis of techniques than a loose, highly personal philosophy. The “holy grail” of a coherent and comprehensive synthetic martial art seemed unreachable. I failed to see how one man could combine the disparate arts into a cohesive whole, especially when each art seemed to demand a lifetime’s worth of study. Fast forward to the mid ’80s and I, as a young black belt, was fortunate to see the television series “The Way of the Warrior” at my instructor’s house in Durban, South Africa. For those that haven’t seen it, this was a brilliant BBC production that explored various traditional martial arts from around the globe in much the same way as “The Human Weapon” has done more recently. There was an episode on the great Morio Higaonna (then in his prime) demonstrating his devastating Okinawan goju-ryu karate (a school from which my own karate lineage is descended). I was buoyed by the episode on Filipino arnis/escrima/kali, an art we already did within our syllabus (in those early days, limited to the Rene Latosa system). In fact I got to train with Cacoy Canete (who featured in that series) only a year or 2 later. My instructor subsequently made numerous visits to the Philippines for further study with a variety of Filipino masters (in particular with Remy Presas). The episode on aikido was relevant to my study since we had frequently cross-trained with senior aikidoka Ken Cottier. In Australia I’d also had the privilege of training with the late, great Shihan Jan de Jong, master of jujutsu, aikido and pencak silat. Similarly the Shaolin episode had some resonance since my instructor was a friend and student of Wing Chun/Escrima master Bill Newman. So it occurred to me that I had a working knowledge (or at least some exposure) to many of the arts featured in that series. Of the remaining arts, Shorinji Kempo, while fascinating, seemed somewhat inaccessible due to low profile in the West and its heavy emphasis on religion. I did however study very closely Doshin So’s authoritative text (published by Kodansha press but now out of print) and was impressed by their “embu” methodology – a concept we have since embraced, particularly after witnessing Shorinji Kempo demonstrations first hand. Tenshin Shoden Katori Shinto-ryu (featured in the “Way of the Samurai” episode) seemed a tad too esoteric to me, although my instructor has since specialised in that martial art, directly under Shihan Risuke Otake, the head of that school (we also studied some of the Tenshin Shoden Katori Shinto-ryu material before we decided to go our own way in 1996). The only other art that stood out from “The Way of the Warrior” as warranting serious attention was the taijiquan episode featuring the late, great Hong Yi Xiang, master of the internal arts and one of the most formidable fighters of his age. I have to say that of all the episodes it was this one that intrigued me the most. Little did I know that prior to the series even coming on air my instructor had already been in negotiations with Hong to study with him in Taipei – something he achieved soon after that fateful video night. What was particularly appealing about Hong’s system was that it manifested itself so pragmatically. Not only was Hong unbeaten in over 100 street fights, his students were regular champions of the Taiwanese “no rules” fighting competition. These include legendary fighters such as Luo De Xiu and Su Dong Chen. The Way of the Warrior episode certainly left one in no doubt as to the practical application of his fighting system. My own instructor adopted Hong’s “sequential, relativistic” methodology in his “Wu-Shin Chi-Dao” system (note – like Hong’s Tang Shou Dao this is not an art, but rather a system of teaching various arts in a particular progression). We in turn have kept this methodology in our own school, using the name “Wu-Wei Dao” to describe our own variant on the theme. Fast forward to the mid-90s and disaster had struck with the death of Hong Yi Xiang. When I went looking in the late 90s I could not find any remnant of Hong’s school (although little did I know that it continued – and persists to the present day, albeit in a different form and with a different emphasis). Fast forward to 2005 when I decided to try my hand at searching one more time for an “heir” to Hong’s system. Once again my searches produced nothing (of course I later came across Lui De Xiu and Su Dong Chen, among others, but in 2005 their profiles on the web were considerably smaller). So my mind wandered back to the name “Chen Pan-Ling”. What was this mysterious art? My own teacher had not taught me this form of taiji (and assuming he knew it, he probably would not have taught it to me anyway until I had mastered xingyi and bagua, in line with Hong’s strict sequential teaching programme). Rather, the taiji system he taught to me from early 1990 was a Yang style he’d picked up from a different source in Taiwan and was clearly a primarily “health-based” style. Imagine my surprise when one of the first entries in my internet search produced an advertisement that Chen Yun-Ching, the son and heir to Chen Pan-Ling’s martial legacy, would be visiting Australia on what was only his second overseas trip. I immediately booked a ticket to Melbourne and went to James Sumarac’s wonderful Wu-Lin retreat where the course was being hosted. On that (and subsequent visits) I was privileged to train not only with Master Chen Yun-Ching, but also his elder brother Lao Shi Chen Yun-Chow. From then on I have made regular trips to train with Master Chen, studying not only his father’s famed taijiquan, but also the family xingyiquan and baguazhang system (and later weapons forms and his father’s synthetic “mountain boxing” forms). What I discovered in Master Chen (as well as his elder brother) was a remarkably dignified, incredibly knowledgeable and inexhaustibly generous teacher who was prepared to patiently correct my form all day – even during the breaks and after the evening meal, often till after 11 pm. On each of my visits I have not taken for granted Master Chen’s generosity in teaching me whatever I wanted to learn. I have generally trained for 10-11 hours per day, often reviewing the days training in my own room until 2.00 am. So what is it that particularly appeals to me about the Chen Pan-Ling system? Who was this man, and why is his name (and his system) still so revered today? Why would famous “strongmen” such as Hong Yi Xiang (and the better known Wang Shujin) choose to study with a man who was, by all accounts, a scholarly, elderly man of slender build (totally opposite to the much younger, rotund fighters he attracted as students)? Well via a circuitous route, we come back to my original dream: the holy grail of a comprehensive synthetic system. 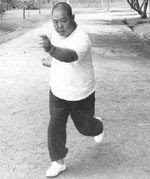 It was Chen Pan-Ling who achieved just that in respect of the myriad styles of taijquan, (and to a lesser extent in respect of baguazhang and xingyiquan). In 1941 the Chinese Nationalist government based in Chunking was faced with many crises, one of which was the rapid extinction of Chinese culture in the wake of the Japanese advance into their country. Accordingly the Departments of Education and Military formed a committee to record and preserve the most functional elements of China’s myriad martial arts. Chen Pan-Ling was the leading civil engineer in pre-war China, distinguishing himself as one of the most respected experts in hydraulics in that country. The fact that he was held in such high regard as a scientist and that he also had an impeccable pedigree in terms of his own martial background meant that he was the logical choice to be the Chairman of this committee. I will let you read Mr Bruning’s article for a description of the style and it’s essential features, including its preservation of the more “combat-oriented” pre-WW2 methodology of taijiquan. For the time being it will suffice for me to say that, from my practical experience of self-defence arts, Chen Pan-Ling’s contribution is nothing short of astounding. As I discussed with James Sumarac, I generally approach eclectic arts with a degree of suspicion and scepticism. However if I were to choose someone whom I feel I could trust to create an effective, logical and comprehensive synthesis, it would have to be Chen Pan-Ling. So the inevitable question arises: have I found the “holy grail” I was searching for all those years ago? The answer is most assuredly no. I can see that this ideal remains firmly out of reach. What I have found is a methodology that suits my own development; a relativistic syllabus that changes as a student progresses (and ages!). Our system of progressing from an external art (albeit one with “softer" elements) of goju-ryu, through to Hong’s bridging forms, through to the internal arts (as taught in the Chen Pan-Ling system) satisfies me as the closest I can get to this ideal. And in terms of at least a synthesis of the various taijiquan styles, I am highly satisfied that Chen Pan-Ling's is as good as it gets. As martial arts is a journey it is self-evident that no particular part of that journey is better than another. My karate (with its added elements) is in no sense “inferior” to the internal arts, for example. All feature strikes, blocks, kicks, evasion, grappling etc. in a balance that suits my physique and personality. But each is more useful at a different stage of my life. Most importantly I feel I continue to improve; the arts build on each other, creating greater skill and less reliance on physical strength (an important feature as I age and succumb to auto-immune disease). In this regard it remains a journey – not a stagnation, where one keeps picking at the same bones, long stripped of their meat, looking for bits one might have missed. Another important feature of my exploration of Chen Pan-Ling’s arts has been the “rub-off” effect on my karate; I have come away with a far greater understanding of my initial art, finding a greater understanding of its common elements and functions. Where before I knew from experience why certain techniques worked (eg. blocks/deflections and evasion) now I can understand and explain how they work (eg. my articles on dominating the melee and karate as “countering” art). This knowledge has had another unexpected benefit: I have seen many martial artists of my vintage “dropping out” or otherwise becoming disillusioned and “stale”. I have, by contrast, been invigorated at a time when my physical abilities are most compromised by the previously mentioned auto-immune disease (Crohn’s and a related form of arthritis). This in turn has had a compound effect on my progress. I was heartened when Master Chen recently gave me the compliment that I’d learned in 4 days what it generally took students one year to learn. High praise indeed! However the biggest compliment I could be paid only arrived in the middle of last year: I received a letter from Master Chen inviting me to be his “inner door” student or bai shi - one of the greatest honours that a master can bestow on his student. It is an honour I have gratefully accepted and I will travel to Taiwan for the ceremony (and some intensive training) in 10 days time! 1. Abi Moriya, a student of Hong Yi Xiang from the '80s until the latter's death in the mid '90s has told me that the system of Tang Shou Dao wasn't as strict as I thought it had been; rather, Hong would teach whatever he felt best suited a student, given the student's age, mental maturity, physical condition, etc. Nonetheless, it seems that a young student entering the Tang Shou Dao school could, all things being equal, expect to learn according to the relativistic structure. Very interesting journey. Do you still feel it is possible to develop the "ultimate martial art" as you put it? Especially in todays world where it is hard to find the time necessary to develop the skills in any art as you mention. Also how can one person hope to be able to pass effective judgment necessary to choose the "best" for incorporation? Just some of my own thoughts on the subject. Is it possible to develop the ultimate martial art? I very much doubt it. Not only are there the issues to which you refer, but also the central problem that what is "ultimate" for someone will change based on their experience and age. However I do believe that within an individual art it is possible to sythesise various styles - provided one has enough experience to "pass effective judgment". Chen Pan-Ling's synthesis of taijiquan styles would be a good example. What I really liked was the sequential training idea of moving through the methodology of the style applied in various ways. Keep up the good work. Sequential relativism is one of the key principles in our martial system. Incidentally, the other person who I have trusted to "combine" elements (albeit again, in a limited sense - not in the sense of a "holy grail") is my first teacher Bob Davies. I still hold the dream that one day I will have enough knowledge, experience, intuition and creativity to pass "effective judgment" on the "ultimate martial art". But let's just say I'm not holding my breath until then! As someone who studied internal arts by way of Tang Shou Dao for four years, I appreciate the information and insight you provide others by sharing your journey. Thank you and best wishes. very interesting story about your meetying with Chen Pan Ling's system. I practice also CPL's martial arts ! I have a question about Hong Yi Xiang, that you quote in your blog. Hong Yi Xiang has been a student of Chen Pan Ling ? So it's interesting, beacause I have read an article on "formosaneijia" that speak about a lineage betwen the CPL's taiji and the Su Dong Chen's taiji. Yes, Hong was a student of Chen Pan-Ling (as was Wang Shujin). They both learned Chen's 99 form taiji. Hong also learned from other teachers, notably Zhang Junfeng. I might be wrong, but I've always thought that Su Dong Chen was one of Hong's students. He has gone on to evolve the CPL taiji form further to suit his own style of movement or fighting. If you look, you'll see that it is still the same CPL base, but with some modification in emphasis and, occasionally, form. I quite like Su Dong Chen's material; he is a master in his own right. As always, I appreciate your reflections and insights. Sadly though, the link to Brian Bruning's article on CPL no longer appears to work. It seems quite a common journey to find (or create) the "perfect martial art". I started my own (very limited) search a few years ago, and have since learned that it's impossible to find a universally perfect style. If it's any consolation though, I have never been happier in all nine years of my training than when I started learning Wu-Wei Dao. You are one of the few people in existence who I trust to create a functionally holistic system. Rather like the late Chen Pan-Ling, I attribute this to your vast martial and scientific experience (as well as your meticulous analyses, interminable reflection and diligent pursuit of learning). I think you're doing a very good job indeed, and I hope you continue to teach aspiring martial artists for many decades to come. Thanks for your vote of confidence Xin. In the end, all I can promise as a teacher is my best. Whether that is enough is another story. But in many respects it all up to each of us to make the journey; others just give us a few directions along the way. Great article. Just one question on the subject of Chen Pan Ling tai chi. I found out recently there's a dispute on whether or not CPL TC contains elements of xing yi and bagua as well as the five tai chi styles. Can you should any light on this? Thanks G. I once asked Master Chen whether the taiji form contained elements of xingyi and bagua and he said it didn't; there are similarities in some movements, but that is not a result of 'fusion' by Chen Pan Ling but rather a consequence of the 3 internal arts being from one family of arts (neijiaquan). In other words, the 3 arts are related, hence similarities appear. But those similarities aren't modern insertions by Chen Pan Ling; rather they pre-existed in the original 5 taiji forms he combined. That's how I understood Master Chen anyway - there is of course a language barrier, so I might not have grasped some nuance! Sorry for late reply, but since you responded, I've solved the mystery. The dispute is because the famous Bagua master Wang Shu Jin practised CPL TC as well and he added elements of his bagua and xing yi to it, forming his own version. Maybe he decided to expand on the similarities Master Chen was talking about.